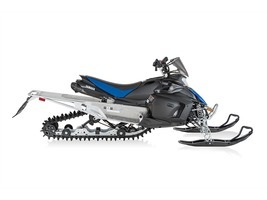 2016 Yamaha Phazer M-TX, 2016 Yamaha Phazer M-TX Lightweight, nimble and a one-of-a-kind deep snow experience. Features May Include: Genesis 499cc Sport Performance Engine A clear leader in its class, the lightweight and dependable sport performance Genesis twin was designed specifically to deliver a quick revving and torque laden power band. An advanced fuel injection system ensures consistent and efficient performance, while a counterbalanced crankshaft results in a smooth and super-crisp throttle response. HPG Rear Shock High Pressure Gas (HPG) shocks with strong 36mm bodies are calibrated to deliver consistent performance and comfort with excellent fade resistance. Lightweight YZ Style Seat Inspired from our family of motocross bikes, the lightweight seat is taller and narrower than a traditional snowmobile seat, providing greatly enhanced ergonomics for an active riding experience. Mountain Powder Skis Wide, single keel powder skis deliver increased flotation in powder snow. The ski is arched in the middle to give additional lift and deflect snow away from the rider. Pro Mountain 144 Rear Suspension Designed for maximum flotation, comfort, bump absorption, and flickable ergonomics, the narrowed Pro Mountain 144 rear suspension utilizes a cam-mounted front shock for improved motion ratio, and a rear cantilever system for consistent track tension. 2-Inch Maverick Track The unique Maverick track is 14-inches wide for a nimble and quick to react ride characteristic and a narrowed tunnel for ergonomics. The 2-inch lugs provide superior traction in powder snow, yet are incredibly durable while running hard pack. YXRC Clutching Featuring Yamaha drive and driven clutching, the lightweight YXRC system delivers smooth engagement, instant acceleration, fast reacting backshift, and cool operating temperatures for a long belt life. Just like its big brother YVXC clutch system, the YXRC is smooth, responsive, and durable. Link Type Sway Bar A standard link-type sway bar keeps the front suspension planted and flat, even in rutted, high-speed turns. Wide, Hooked End Handlebars No other touch point is more important to a rider than the handlebars. Yamaha bars are flat and wide, engineered for comfort, control, and natural ergonomics. Integrated hooked ends add additional control while cornering, and feature heated grips across that span the entire length.